"This, along with the fact that The Notorious looks to have the mental edge going into fight week, is why I'm backing McGregor to win via KO/TKO in Round 2 (which is available at 9/2 on the Sportsbook)." It's been a long time coming but finally, this Saturday night, Mixed Martial Arts makes it's long awaited debut in New York, where Madison Square Garden will play host to one of the most stacked UFC cards in recent history. The "fastest growing sport in the world" has long been forced to elude the Big Apple due to it being illegal up until late this year, but what better way to announce itself than by having the biggest draw in the industry and a card featuring no fewer than three championship bouts. That's right folks, Conor McGregor is back, and he's seeking to do what no man has successfully completed in the UFC before, become a two weight world champion while holding both belts simultaneously. His opponent? Newly crowned Lightweight champion, Eddie Alvarez, who shocked many with his first round KO of Rafael Dos Anjos last time out. What we have here is a Lightweight title fight, where should McGregor win, he will own both the lightweight belt, and the featherweight belt (something he actually achieved in his pre-UFC career at UK-based MMA promotion Cage Warriors). I've been studying this fight from the moment it was announced and it really should be a crowd pleaser for a number of reasons. In McGregor, we have a technically sound, elusive striker, who possesses deadly knockout power as shown in various highlight reel finishes from his stint in the Featherweight division. Although his power may not seem to be as effective in this higher weight division, a lot of credit should be owed to Nate Diaz, who happens to have one of the best chins in MMA, therefore it would be foolish to underestimate Conor's power solely based on his lightweight debut. On the other side of the octagon we have a totally contrasting fighter in Alvarez. He's very much a jack of all trades, but in my opinion, a master in no one area. He has decent hands, solid wrestling, and he certainly isn't a fish on the ground (he is a brown belt in Brazilian Jiu-Jitsu). He often likes to hold his opponents on the fence and really wear them down with his constant pressure and dirty boxing. 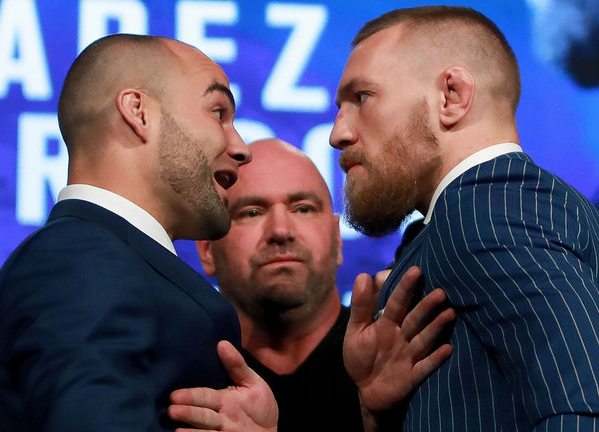 On paper this should be quite a difficult match up for McGregor, because in theory Alvarez could make this fight ugly and really grind out a decision. However, the one loophole I have that I simply can't get away from is that Alvarez is extremely hittable, and if you study tape on his last three, five, or even his early Bellator fights, he gets rocked. A lot. Granted, he always seem to recover very quickly, but you have to think that sooner or later it is going to take its toll. This, along with the fact that The Notorious looks to have the mental edge going into fight week, is why I'm backing McGregor to win via KO/TKO in Round 2 (which is available at a generous 7/1 on the Sportsbook). I'm going to give Alvarez the benefit of the doubt and assume he gets through the first round, but I feel as they go into the second round and both fighters loosen up, McGregor will find his range and clip him resulting in lights out for Alvarez. Sound the alarms, ladies and gentlemen, we may be looking at a new two-weight world champion.